Douglas Fairbanks and Indiana Jones were cited. They pulled from a ton of people, and the voice-actor Zack Levi had a hand in it as well. John Lasseter approached them with a story that had been around since the 1940s. It was a challenge they were up to. Every classic story made into a Disney film, that becomes the one everyone knows. They didn’t feel chained to the story. Wanted to keep the core, but add onto it. Explained that Beauty and the Beast was radically different in story form. Give it a fresh take and make it for everyone. Needed someone Rapunzel could talk to. They didn’t want the boring, ordinary side-kick. Rapunzel was a rough-and-tumble girl, so why not a lizard? This is a story driven by two characters, not one. You wouldn’t name Toy Story… Buzz Lightyear. Collider: Let’s go ahead and start with the Flynn Rider character. Did Errol Flynn have an influence on him? A little bit of the name sneaks through a bit and the swashbuckling nature of him. So was he an influence? 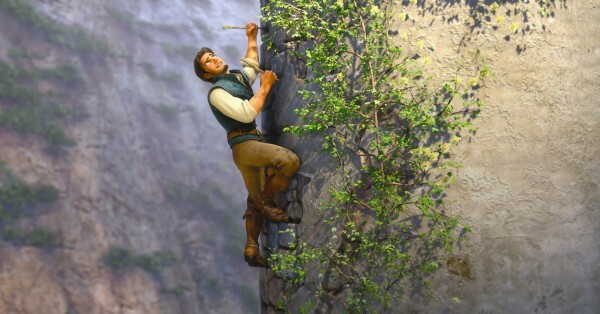 Nathan Greno: Honestly, there’s not one character that we looked at to make up Flynn Rider. We looked at Indiana Jones (Byron Howard: Douglas Fairbanks). There were a number of people that we looked at. Sort of what are the best, the greatest swashbuckling characters? Like the most fun to watch on screen, those were the ones we looked at. 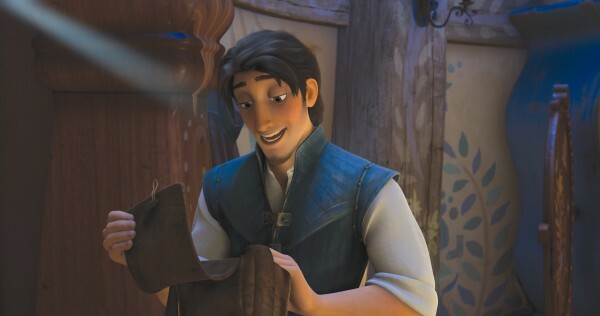 We tried to take the best of these characters and put them in to what created Flynn Rider. Byron Howard: We were looking for a type, because we knew we didn’t want him to be a prince; we wanted him to be a thief. We wanted to flip it and we needed a personality that would be charming yet sort of confident. He’s got to have a suave self-confidence about him, which can so easily go to an unlikeable place. We had to find a way to make this guy really likeable. You had to like him right away, and part of that was finding Zack Levi from Chuck as the voice because he’s got that. So did Zack Levi’s own personal character leak through? I know a lot of times the voice actors come in after the fact to voice, so was he a big influence? Howard: What usually happens is you will start very general on a character; an archetype. Then you say we want this guy to be a confident ladies’ man/thief. And then you’ll kind of build it as far as you can and then once the voice talent comes in you go, “Okay, whoa, now it just got way more specific.” It’s like he would say this, but he wouldn’t say this. And so, even having the voice talent come in for the first time informs how you are going to write for this guy and what kind of things and choices he would make. It’s just easier once you can get someone in the room to hear something come out of their mouths. Greno: It really is this crazy process of, we do something and then the voice talent does something, and then that goes back into what we’re doing, and the next time we meet with Zack we are like, “Okay, we’ve developed the character even further based on what you did,” and we mixed it back in here, and what the story artists and the animators did and it just keeps going back and forth, back and forth. It’s kind of cool because everyone starts to own the character. Zack will be in there and say, “Ahhh, this doesn’t sound like Flynn,” and that’ll go back to the animators, like, “I don’t think Flynn would do this,” and all of a sudden everyone starts owning who this person is and what happens is, over time, you get a real person. If you do your job right, it’s a well-rounded, three-dimensional, real person. 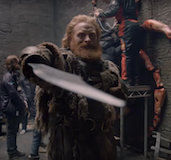 You’ll know what he would do if you put him in a situation: what would Flynn do at Comic-Con? We know, because to us, he is a real person. Bouncing off of that collaborative effort, what is it about animation that lends itself to having co-directors? Obviously this isn’t the first time that this has happened. This is kind of a trend in animation right now. Obviously, Byron, you co-directed Bolt in the past. So what is the collaborative effort between you two? Howard: I think even back to Ron (Clements) and John (Musker), who have been directing Disney films for decades; they were one of the earlier teams. I think just because the films are so massive and it takes so long to create, it really helps to have someone like a creative partner to bounce ideas off of. I think it’s kind of like each have super powers, like Nathan has these great story skills and great writing sense while I come from animation so I know about that. So, together we make a stronger whole, and that is just a better way to make these films. Greno: It’s great, because we both have strengths and we have overlapping strengths as well, but then we go from meeting to meeting and we both compliment each other and elevate as we go. Together, we’re constantly working things out over this process. It’s almost like we’ve become one mind in a sense. It’s cool because we will be sitting there in meetings and then we will both lean forward to say something, and I’ll just say, “You got it,” because I know he’s going to say what I was just thinking. Howard: You have to kind of get to that place where we’re completing each other’s sentences because what you don’t want to do is give two different messages to your crew. You have to be absolutely clear when you leave the room that they’re not confused about what we’re after. And that’s great because I think we’re always on the same page. Describe how you two were put together. Did you work previously in different departments together on one project? Howard: We both went through internships in Florida for the Florida studio when they had one down there, and I knew Nathan for years before I worked with him. Greno: We were in different departments on Bolt, where Byron was one of the directors and I was head of story, so I oversaw the story department and we worked closely on that. Then we did a short that was done for the DVD that I directed because Lasseter sort of gave me the keys to the car, which was kind of like, “Here, you can try your hand at directing.” So, in doing that, I worked closely with Byron. And there were a lot of departments that were new to me, because I was in the story department so I knew story and editorial, and Byron knew all these other departments, so it was really great working with him and doing that. It was like, “Oh, we’re like a really good team,” and so when it came to Tangled, we just both went forward and said, “Yea, we should work together,” and we did. How did yall get involved with Tangled? Greno: Well that was John Lasseter that asked both of us if we would be interested in directing the film, and of course when John asks you if you want to direct the 50th animated film for Disney, of course you say yes. And we were so excited to do it and we were both onboard from the get-go. Howard: Oh yea, definitely, because it’s like what Disney is famous for, taking these kind of famous tales and making films out of them, and then this was one that we knew well. It had been around for years and with the studios since, I believe, the ‘40s in some form or another where they were trying to find a take on this thing that would work. Once Nathan got in there story wise, things started to open up with Rapunzel’s character. I think he was really dedicated to kind of swinging her away from the noble princess thing and giving her a real personality. Like we always talk about this sort of girl-next-door who you know you can relate to. Even in the way she deals with the world, she has to be naïve but she can’t be stupid. She has to be a really smart individual because she has to drive the story. You’re not going to root for a stupid person. She has to be someone who is charming, sweet, dynamic, and really…daring. She has to be the kind of person who is the fire that moves the story along, so that was great to see that he was after that from square one and we really tried to perpetuate that through the film. Greno: And the great thing is with Disney, if you make these movies well, if I say Snow White, you think of the Disney version, if I say Cinderella, the first thing that pops into everybody’s minds…it’s the Disney version. 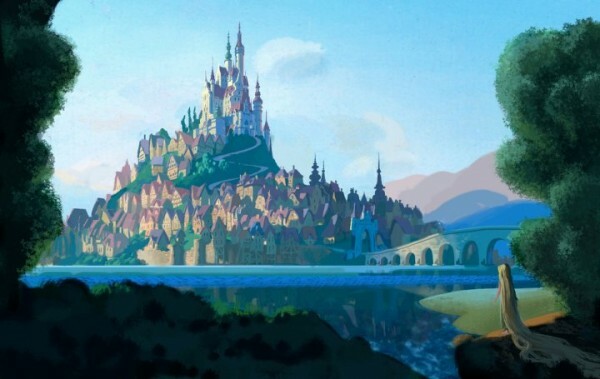 So, for this movie, to make the definitive version of Rapunzel…of course we’ll do it. Those are huge shoes to fill, and we were up for the challenge. Almost every Disney story has an underlying message. Yall mentioned how Rapunzel herself has a very interesting story, where she is shut off from the world, but it’s hard for an audience to relate to that. So what do you think is the underlying message in Tangled? Greno: The great thing about this movie is that the place where a lot of people have been is that everyone wants to find their independence. Everyone wants to be their own person, so it’s the same thing. At the core of it, that is what Rapunzel is going through. She doesn’t want to be a little kid anymore; she wants to be an adult. Everybody feels that way, I mean even when I was a kid, when your eight-years-old, you want to do to what you want to do, and stand tall and be your own person, and that’s what this movie is. It’s finding your independence and that’s the thing you can relate to throughout this film. Howard: Yea, because you can always think about your own life and it’s like, okay, what’s keeping me in my tower? What’s holding me back from what I need and what I want, to become the person I want to be. Rapunzel has a very physical representation of that in the movie, it’s actually a prison. It’s a beautiful prison, but it’s still somewhere that’s not going to let her grow. When you see her for the first time in the movie, she’s 18 and she has filled these walls with paintings because her mind and heart are so full, so she has put it all up there on the walls and she is out of room. She’ll wither and die if she stays there, so she has to find a way out. 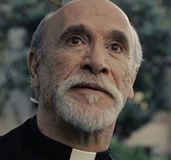 I love movies where you have characters that are closed in and you see them get out in the world and really see what richness and emotion the world has to offer. Greno: Everyone has goals, and everyone has dreams, and that’s exactly what this movie is. Rapunzel and Flynn, the movie is about both of them. If you took Rapunzel out of the equation for this film, it doesn’t work. If you take Flynn Rider out of the equation for this film, it doesn’t work. You need both of them. They both have dreams and goals, and I think that’s what people will relate to; the two characters on this journey. Okay, so what’s with the chameleon? 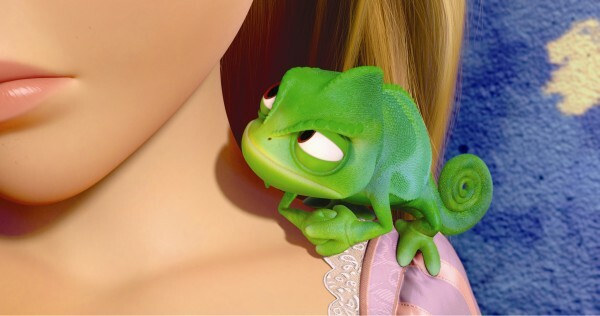 Of all the creatures that you could have Rapunzel kind of tag along with, why Pascal? Greno: Squirrel…you’ve seen it. You’ve seen all these things; this is the 50th movie that Disney’s made. So what we wanted to do is something fresh, something different. This girl, she’s not a dainty, precious girl. She is this rough and tumble girl next door. So what would she have? She’s not going to have a little, pretty bluebird on her shoulder. She’s going to have a lizard. That is her. She’s different. So when it came time, we put a lot of thought into this and Pascal, this little tough guy that sits on her shoulder, that’s different, that’s fresh, and that’s the whole movie. That’s constantly what we’re shooting for. You mentioned Rapunzel’s mother, Gothel, and obviously the original story is very gothic and has an interesting twist. How chained were you to that story? Howard: We were trying to take all these things in the same way that they took the original story of Beauty and the Beast, Aladdin. You take the core of the story, what people can almost recite to you if you asked them on the street. 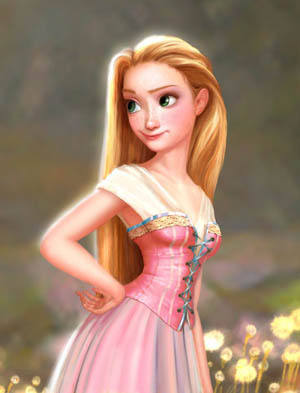 What do you know about Rapunzel? The tower, the hair, and the witch. Greno: And “Rapunzel, Rapunzel, let down your hair.” Those things are all there. Everything you know about the story, that’s there. On top of it, there’s a fresh layer of contemporary filmmaking with comedy, action, pacing; that’s also there. It’s this constant balance between the two. I believe we have stayed true to what the original story was and at the same time, we’ve made it into a film for everyone, and it’s a contemporary movie; it’s a film for the now. Howard: We tried to make a fresh retelling of the tale. This is just like Beauty and the Beast was a fresh retelling of that story. When I first heard that they were going to make Beauty and the Beast at Disney, I was like, “Oh, God, there’s no way I’m going to see that movie,” because I knew what that movie was, was just two people sitting down to dinner over and over and over again. 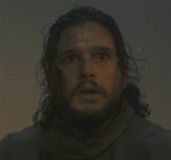 But then when I went to see it, it was like, “Oh, they made it work.” These are characters I like, and they came up with twists and angles that I had never thought of before, that just, frankly, aren’t part of the original story. They took that core and expanded on it and let it grow. The original story served a purpose in the written form, but then when you go to film. It’s a visual medium and with animation there are other things you need to get in there for character types, personalities, music, and visual appeal that you have to let the world blossom from that original seed. 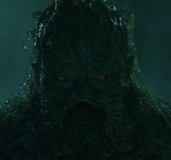 Greno: It’s great because we’ve had preview screenings, where we go to these outside audiences, and we do interviews after the film and the thing that we’re so excited about is that this film works in layers. We will have a younger audience of kids that will see it and love it. Love the film, and they’ll say, “This film is great; this film is for us.” Fantastic. Then we’ll go to an older audience, and they’ll say, “This is great; this film’s for us,” because there are layers to this film that work. And we don’t speak down to kids in this film; there’s the right balance of being for kids and adults. As those kids grow up they’ll realize, “Oh, wow, there’s all these other layers that I didn’t notice in the past,” and everything is there. This is a movie for everyone. Okay, so final two questions here. You mentioned that the dailies were a very big thing in the Character Creation panel. Obviously Pixar has always had a collaborative effort where they pick each other apart (Byron: Definitely). Is that a Pixar influence since Lasseter has come over or is this something that has been here in the past? Howard: It seems like it’s a CG influence, because honestly, when I was back in TV, it was really you, as the animator, and the director, alone in a room. And they would give you your input and you would leave. And then when I saw what the CG animators were doing, even on films that were prior to Bolt at Disney, it was like, “Oh, their actually getting together in a room and critiquing each other’s work. And their making their stuff so much better that way.” When you’re an animator, it’s very isolating, or it can be. You’re at a desk, either drawing or using a mouse for hours on end, and staring at a paper or screen. You’re kind of in your own little box. So what dailies do is it gets you out of that box and get’s you to look at your scene or your work with all these other eyes. You get like 60 other eyes and people tell you what they see. Because your objective is really to kind of get something on the screen that everybody, millions of people can look at and understand exactly what you were trying to get across. It’s really challenging, because there’s subtleties in this movie where we were asking the animators to just move the mouth up a hair width, or that’s not quite a smile, bring that down just a little bit and just open the eyes (Nathan: Millimeters), and just tiny, tiny things. Just showing a person in one image and then a slightly altered image can get a completely different response. Again, we were asking them to do things that I don’t think has ever been done in animation, acting wise, and they were really amazing. That was where Glen was great in the room, to have his experience and have his drawing ability, because things we were after, Glen was able to draw and articulate in line work, and then the animators could go back to their desk and match that with their CG models and stuff, and it brought the animation to a whole new level. Greno: Well and honestly, Byron and I, in a very good way, I think we drive our crew really hard. We don’t settle for anything. We look for the best in people and we constantly challenge people, and we’re constantly trying to bring out the best work in people, and I think that’s something we really appreciated in John Lasseter. He does the same thing, so for him to come into the studio is a way to back us; and this is the way we want it to work, and John saying, “It’s ok to work that way.” You don’t have to settle for anything. You can really bring out the best in people; you can challenge people and do things over and over again until you get the best out of everyone. We really appreciate that in John; that he backs that way of thinking. Final question. Obviously, Beauty and the Beast has the classic name, and the same with Snow White and Sleeping Beauty. Everybody has kept the original name. 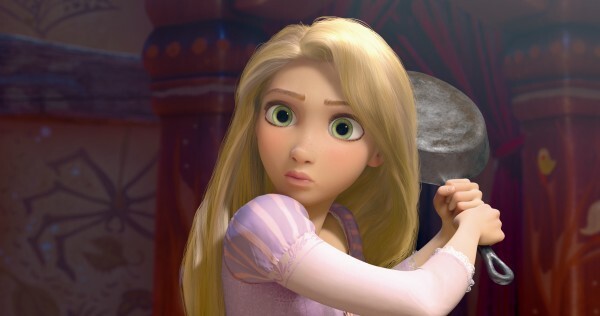 There was kind of the opinion that you took the name Tangled to appeal to boys by slicing down the middle instead of just going after the female audience. What do you think of this? Greno: Honestly, you know what we did? We sat back and… this is true… we sat back and looked at the film, and as much as, and I said this before, this movie does not work if Rapunzel’s not in the movie and it also does not work if Flynn Rider’s not in the movie. This is the story of the two of them, and you can’t make the film without one or the other. So, because of that, we wanted a title that reflected the movie that we were making. Rapunzel, it’s like calling Toy Story… Buzz Lightyear. Why would you do that? That’s the story of Buzz and Woody, so they call it Toy Story. This is the same thing. This isn’t the story of one character; it’s the story of two characters. So we needed a title that reflected that. Now, some might scoff at that final answer, but his point is incredibly valid. 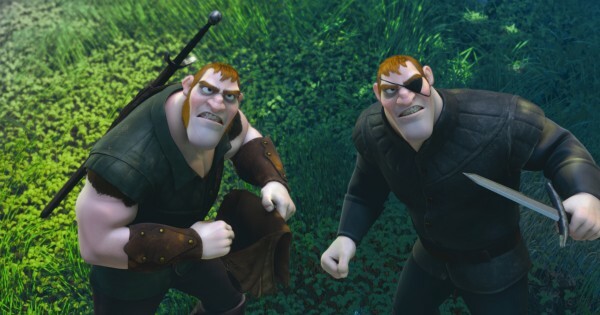 Many of these other classic stories focus on one character, whereas Tangled is striving to have two fully-developed, three-dimensional characters. Beauty and the Beast benefits from having a title ripe for two characters, but Rapunzel simply did not. Whether you accept Nathan Greno’s explanation or not is completely up to you. As far as the movie is concerned, I think it looks entertaining. I also think Pascal, the chameleon companion of Rapunzel, will be a big hit. I found the trailer that ran before Toy Story 3 and Despicable Me to be funny and interesting, and after seeing more footage and how much effort is being put into the film, my anticipation has risen even further. 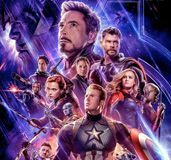 Of course, it’s all about the finished product, so only time will tell if the early footage is a true indication of what the entire film has in store. Tangled hits theaters November 24, 2010. All week will be completing our Comic-Con 2010 coverage, as we have plenty of interviews to upload and transcribe, so stay tuned. For more on Tangled, check out my coverage of the Disney Character Creation panel from Thursday right here.